Netflix subscribers around the world watch more than 90 minutes of video from the streaming service every single day on average, according to new estimates from The Diffusion Group, which also reported this week that the overall amount of Netflix streaming has increased 350 percent over the last ten quarters. The Diffusion Group’s new Netflix report bases its estimates on streaming volume data released by [company]Netflix[/company]. In January of 2012, Netflix said that its subscribers had watched a total of two billion streaming hours in the preceding quarter, which translated to a little less than an hour of average viewing time per day. In Q2 of 2014, that number had grown to seven billion hours, which equals 93 minutes of average viewing time per day. As Netflix continues its international expansion, more and more of that streaming time comes from outside of the United States. In Q3 of 2011, 94 percent of all Netflix streaming hours were coming from U.S. subscribers, according to the report. 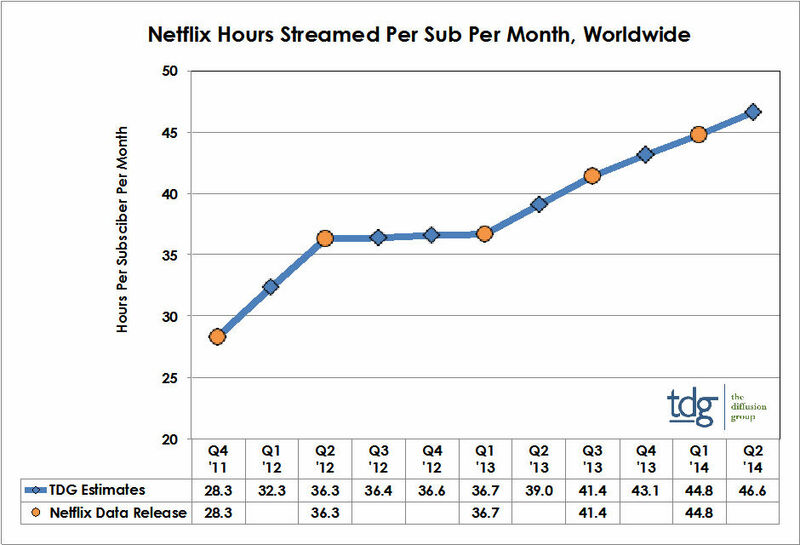 Fast forward to Q2 of 2014, and the U.S. contribution to Netflix’s total streaming hours declined to 72 percent. Expect that number to go down even further in coming quarters as a result of Netflix’s most recent expansion into big broadband markets like Germany and France. And with the amount of daily viewing increasing, subscribers are also consuming ever more bandwidth. Recent numbers from Netflix’s ISP speed index show that U.S. subscribers stream their movies and TV shows with an average speed of 2.57 mbps, which roughly equals 1 GB of data consumption per hour streamed. This means that on average, a U.S. Netflix subscriber is burning through 45 GB of data every month. Of course, in reality, each consumer’s data consumption may vary widely. Netflix performs a lot better for customers of some ISPs, and worse for others. The individual service plan as well as the type of programming viewed can also impact a user’s data consumption. For example, Netflix advises its subscribers that 4K streams can consume up to 7 GB of data per hour. As the amount of 4K programming on Netflix increases, one should expect the average amount of data consumed to go up as well. Wait until 4K takes off more. What’s bad though is the data limit almost all ISPs now have. Like AT&T only allowing 150 GB per month, and most cable only 200 GB per month. These limits are TOO LOW and have no reason or purpose other than to be anti-competitive against others to their own TV offerings. I hope the FCC wakes up soon on this serious problem. Yeah, we’d believe this. It’s crazy how appealing TV watching becomes when it’s free of loud, obnoxious ads and the channel you’re watching plays only awesome stuff that you love all the time.